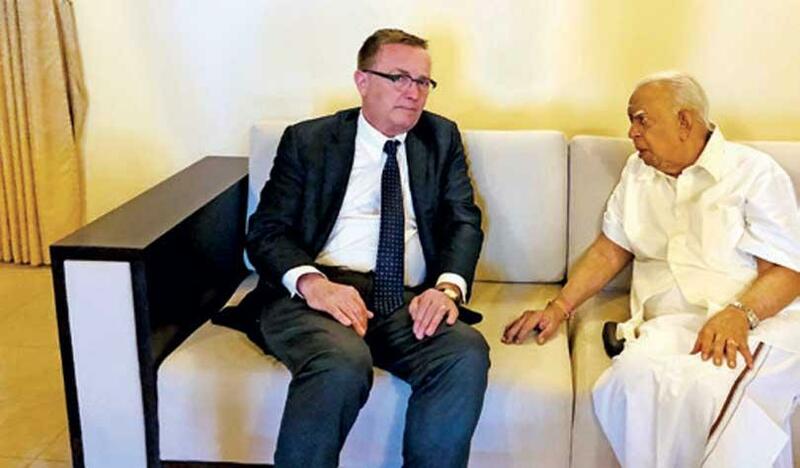 Former United Nations Under-Secretary-General for Political Affairs, Jeffrey Feltman yesterday met with Tamil National Alliance (TNA) leader R. Sampanthan in Colombo and commended the role faced by the latter’s party in the aftermath of events that unfolded on October 26 last year. Mr. Sampanthan said Tamil people regarded and respected the Constitution and that his party always stood for principles and practices rather than toiling for cheap political gains. “The Constitutional Council (CC) was extremely cautious in appointing people to high offices. This was one of the reasons why unconstitutional moves did not get approved by higher courts,” he said. Speaking on the UNHRC resolution, Mr. Sampanthan said institutions such as the Office of Missing Persons, Office of Reparations and Truth and Reconciliation Commissions, should function actively and be in constant contact with the people to ascertain the truth. “The victims should be consoled and made to feel that the government and the general public truly care for them,” he said. Meanwhile, he said the government and a group of politicians were attempting to give a new twist to this issue in order to stoke ethnic tension between the Sinhalese and the Tamils, though this was solely a fundamental rights issue. Briefing on the Constitution-making process, Mr. Sampanthan said a lot of work had been done on this matter since the enactment of the 13th Amendment in 1987, but that there was no commitment and political will. Mr. Sampanthan requested the former UN envoy to highlight the Sri Lankan crisis internationally in order to ensure the Sri Lankan Government fulfilled its commitments to the international community. TNA was a part of the defeated LTTE. These people are still on bending dividing the country. Western meddlers are happy about this as their agenda is to see a divided Sri Lanka to fulfill their geo-political agenda.